GET TALKING. 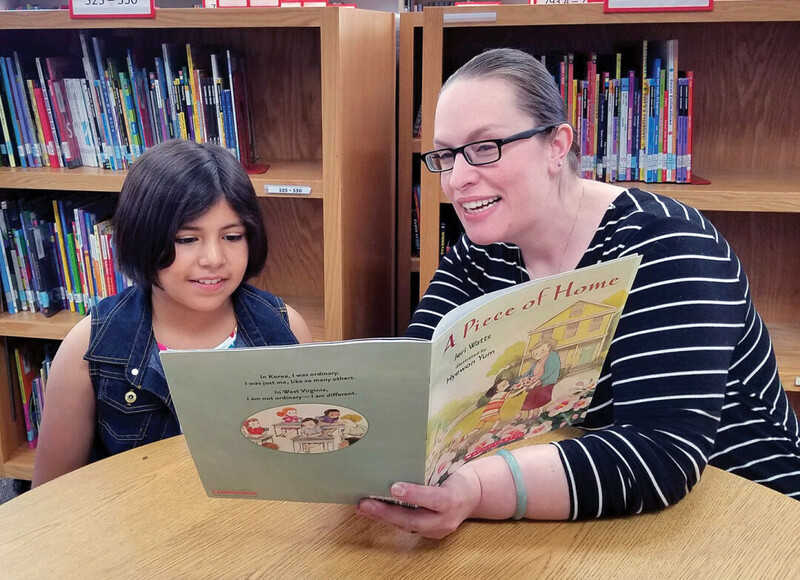 Becky Linderholm, co-leader of the Family Conversation Kit projects, reads “A Piece of Home,” one of the books included in kits available for checkout at local libraries and institutions. Most parents hope their children will be better than they are: that they’ll achieve further education, get more rewarding jobs, and be more compassionate toward others. A team that sprung out of the community-building project Circles of Change will assist Chippewa Valley parents in fulfilling that hope. Family Conversation Kits contain books for children with an accompanying guidebook for adults or teens with the goal of becoming more comfortable with diversity.“Experts say that if we want our children to be unbiased and accepting of all people, we must talk to them not only about ways in which we’re all the same, but also about our differences and the differences in how we experience the world,” explains Becky Linderholm, co-leader of the project. Research shows the more positive, counter-stereotypical images of others that kids see – even in books – the more likely they are to embrace diversity as they get older. So why does it matter, besides making us better neighbors? We live in a multicultural, ever-changing world. Raising children who welcome all types of people means they can work and coexist while seeing the world from other perspectives. Recent scientific studies conclude that intercultural relationships spark creativity, thus making this generation better students, workers, and people. Ideally literature should reflect the lives of all people, but children’s books still lack diversity. A 2015 study from UW-Madison’s Cooperative Children’s Book Center showed that about 73 percent of books published that year depicted white characters. Not only do books build empathy by allowing us glimpses into others’ lives, they can serve as “mirrors” for children in marginalized groups. Lor, along with a team of educators from the Chippewa Valley, read hundreds of books to make selections for the project. They looked for texts in which the main character and the author are part of a represented group. These books alone are a significant asset, but the team also compiled guides for families, including conversation starters for the books, lists of words to avoid and words to use (and why), answers to frequently asked questions about diversity and equity, as well as a list of other age-appropriate books on the topic and recommended books and websites for adults. The group developed kits for various ethnic groups and for different age groups (early childhood, young readers or tweens, and teens). Currently, Latinx and Asian kits are available and LGBTQIA+ kits are in the works. Next up will be kits that highlight black/African-American people and Muslim people. Dr. Audrey Robinson, founder of Circles of Change, wrote a grant through the Mahmoud S. Taman Foundation to fund the initial kits, with additional funding from the City of Eau Claire, Eau Claire County, the Eau Claire Area School District, City of Altoona, Chippewa Valley Technical College, and private donors. The kits are funded by donations as a program of the Luginbill Children’s Foundation. Kits are available to check out at public libraries in Eau Claire, Altoona, and Chippewa Falls; the Boys and Girls Club’s Mary Markquart Center; the Family Resource Center in Eau Claire; and UW-Eau Claire’s Children’s Nature Academy. Linderholm’s goal is to raise her kids to recognize when peers may be treated unfairly and to do something about it. Family Conversation Kits help make it possible for other parents to accomplish the same. To learn more about Family Conversation Kits or to make a donation toward the program, visit squareup.com/store/FamilyConversationKits or facebook.com/FamilyConversationKits. To learn more about Family Conversation Kits or to make a donation toward the program, visit squareup.com/store/FamilyConversationKits, facebook.com/FamilyConversationKits, or follow @FamilyKits on Twitter.